Russians set up branch in KK | Daily Express Online, Sabah, Malaysia. Kota Kinabalu: The first branch office of the Russian Centre of Science and Culture (RCSC), here, is set to expand the existing cooperation between Malaysia and Russia in the culture, economic and education spheres. Towards this end, Chief Minister Tan Sri Musa Aman said the State Government is always open to discussing possible ventures. "We (State Government) will do our best to facilitate investments and other programmes that are proposed," he said at the opening ceremony of the RCSC, here, Wednesday. "The RCSC has been operating in Kuala Lumpur since 1981 and now a branch has been established in Sabah, which I view as a positive step. "This effort will introduce Russian culture to more Malaysians in Sabah and will also serve to promote what Sabah has to offer to Russians. "This is a good platform in further boosting the tourism industry, and I believe the setting up of this branch office will not only introduce the culture of Russia to more Malaysians in Sabah but will also act to promote Sabah'S culture to Russians. "This centre is also a timely step in encouraging further economic, education and research and development exchanges for both countries." 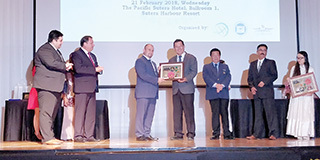 His speech was read by Assistant Tourism, Culture and Environment Minister Datuk Pang Yuk Ming. Among the programmes offered are by the Kursk State Medical University (KSMU) Russia which has produced over 1,000 Malaysian graduates in the medicine field. A majority of these graduates are now serving in government and private hospitals or clinics in Malaysia, including in Sabah. "I understand that at present, KSMU has around 570 Malaysian students. "We hope to see more graduating from this university and eventually serving back home. "As Honorary Professor of KSMU, I am proud to note that we have many Malaysian graduates from this university," he said. Musa added medical care is crucial and remains an important part of ensuring a healthy society, where preventive care is focused on and where treatment is given through heavy government subsidies at government hospitals. RCSC Director Dr Airat Akhmetov believed that humanitarian cooperation brings people from different continents and countries closer as well as allowing them to understand each other better. "And I am sure that opening of the representative office of the RCSC in Kota Kinabalu will help for the further development of the friendly ties between our countries," he said. Akhmetov said the RCSC has always been making educational assistance a priority and continues to make the necessary effort to provide Russian educational services to Malaysians. "Malaysia holds the absolute first place among the countries of South-East Asia in the number of students studying in Russia. "There currently are about 4,000 of them living and studying in our country." He added Russia is not only promoting medicine specialties now, but also engineering, machinery, air crafting and oil and gas industry. "Russian Centre have close contacts with Malaysian universities, institutes, colleges and schools," he said. Meanwhile, MGM Enterprise Director Kanoo Pillai who manages the RSCS branch office here, said it would operate from March 1 at Damai Point. "Before the setting up of the RSCS, we have been promoting studies on medicine and aerospace aviation engineering. Since 2000 there have been more than 300 Sabahan graduates from the KSMU," he said. "Previously, we operated in an office in Beverly Hills. Now, with the establishment of the RSCS, we will be promoting the whole of Russia. "But again, it will depend on the programmes and its recognitions…only those recognised by the Malaysian authorities will be promoted." The centre will provide guidance and consultation for a proper pathway to study in Russia.